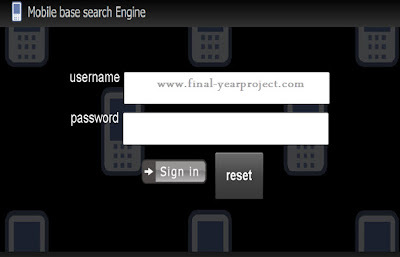 This is a good final year Computer & IT engineering project report on "Android Operating system at mobile based search engine and submitted in partial fulfillment of the requirement for the award of BTECH. By this project, a unique search engine was presented for effective searching of information through mobile interface. The engine adopts three methods for retrieval: two autonomousand one combinational. You can also Subscribe to FINAL YEAR PROJECT'S by Email for more such projects and seminar. Android is an software platform and operating system for mobile devices. It is based on the Linux kernel. This project uses PHP, Flex as a front end and MS SQL SERVER 2008 EXPRESS as a back end software. This project contains 3 module viz, search, user and database module. Report also contain different E-R diagrams, object diagram, flow charts, sequence diagrams, coding etc. Use this project for your reference and study work.